This parade of homes is a little different from the traditional one. Instead of traveling by car to swoon over beautifully decorated homes, this parade of homes can be enjoyed from the comfort of your home. You can veg out in your favorite chair, wearing your pajamas while touring the homes in this parade. To me, a parade of homes like this sounds heavenly. There are no worries about what to wear and you don’t have to put on makeup. 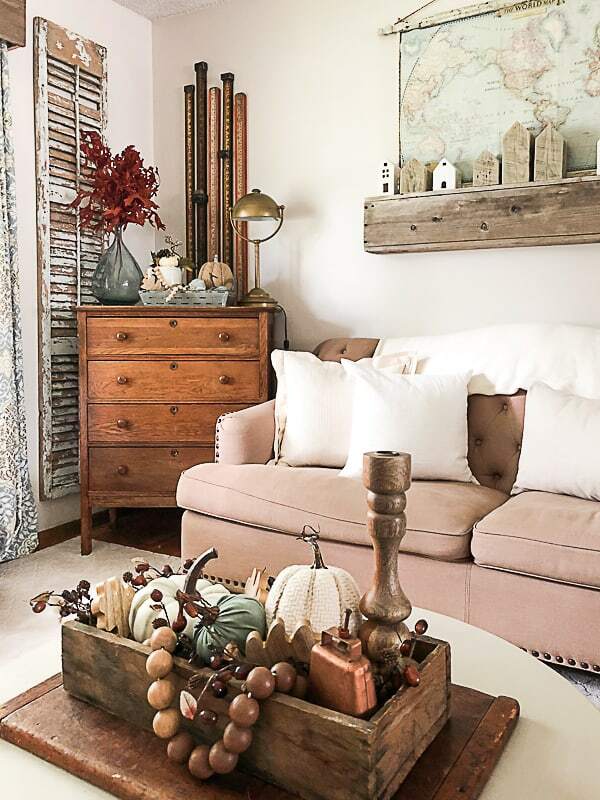 You get to see beautiful homes decorated for fall without going anywhere. This parade of homes is more my jam and I am so happy that Kendra, from Joy In Our Home asked me to be a part of it. This parade of homes is brought to you by a group of talented bloggers who have been working diligently to get their homes decorated for fall. You can find all of the homes in this parade at the end of this post. For me, fall decorating has taken me a lot longer this year. 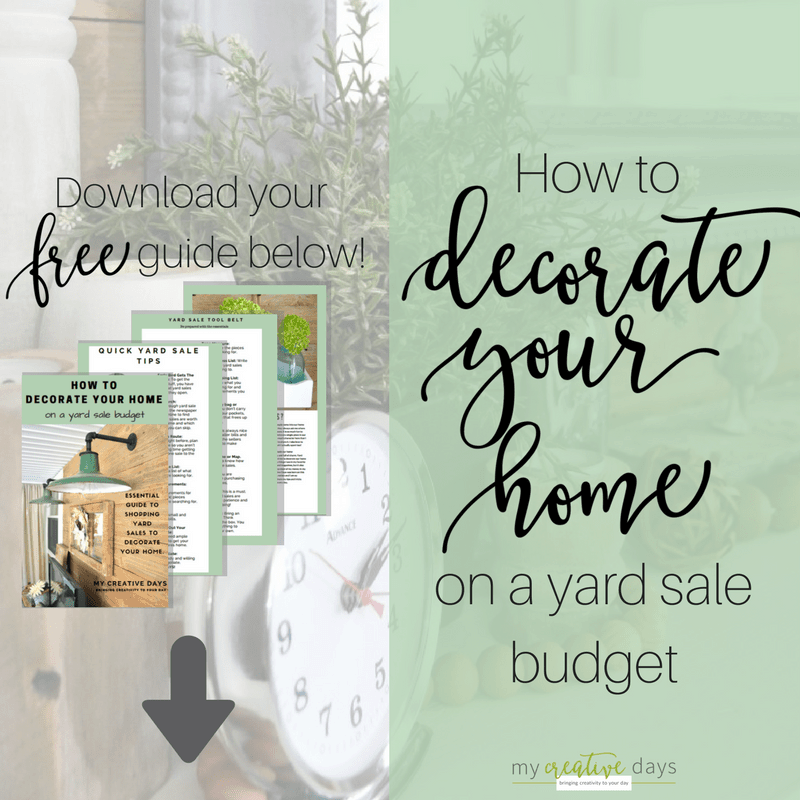 I got rid of so much fall decor and took my time because I wanted to make a change in our living room. I knew things would come together, but I didn’t want to rush it. 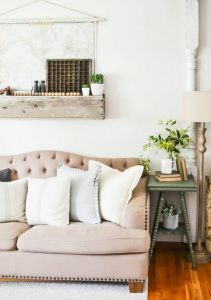 I love adding new pieces and accents in our home and when we do that, I always get more excited to decorate. 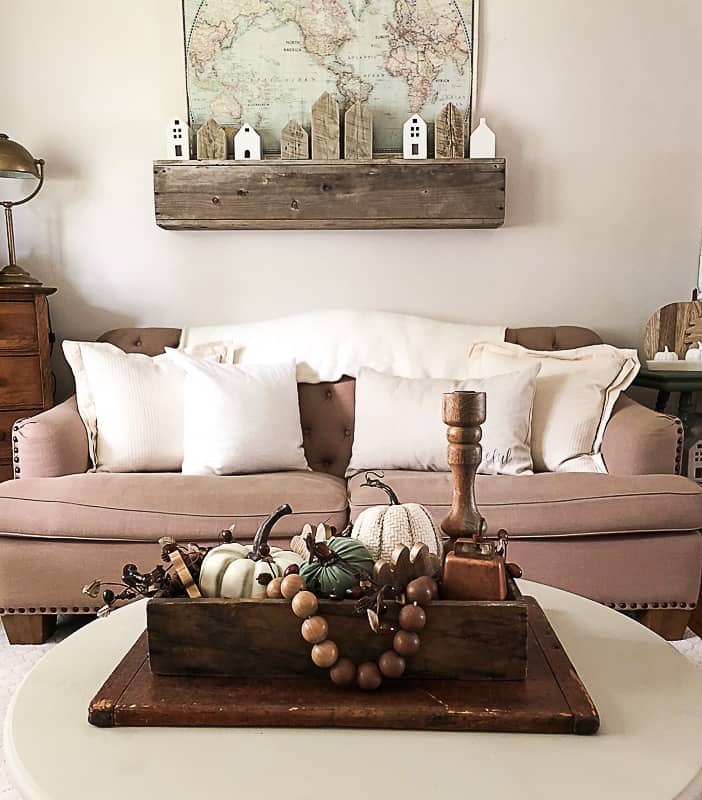 My fall decor started with the wood fireplace mantel we added to the living room. This addition has been so exciting for me! Not only did I paint it my favorite color, but it gave me another area to decorate. You won’t believe how much the mantel cost, what came with it and what it looked like when we bought it. 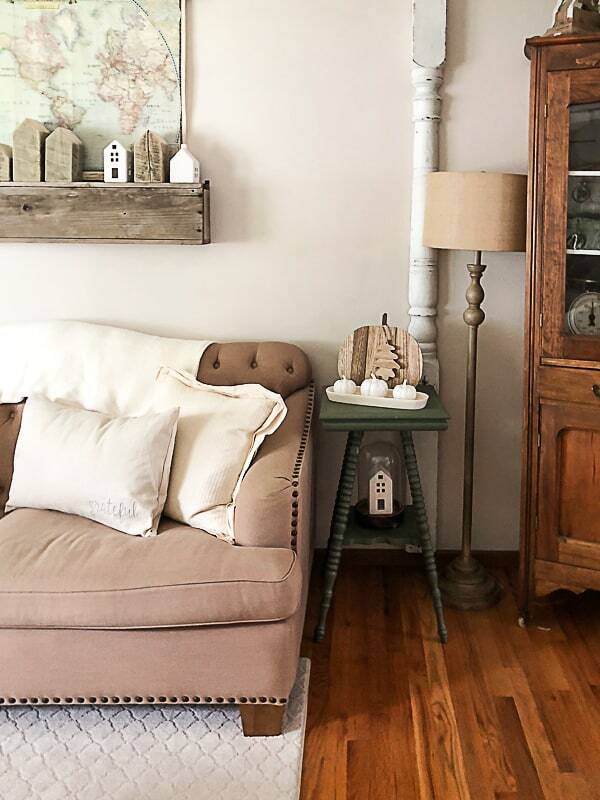 Find all the juicy details about the entire mantel project HERE. 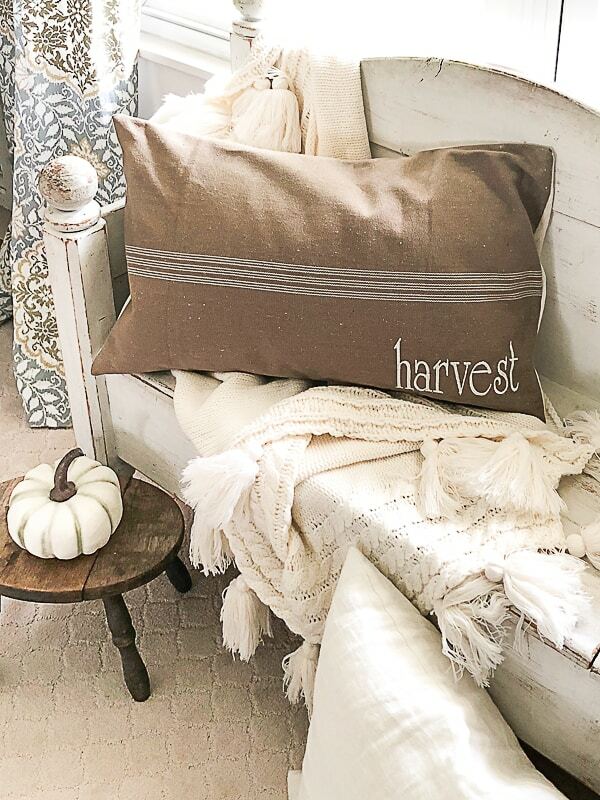 The Harvest pillow was my favorite and it fit the white bench in the living room perfectly. 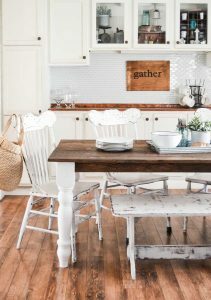 The Gather pillow will be in our house way past fall. I added it to the sofa for now, but I think it will live on our bed after the fall season. Being grateful is not a seasonal thing. It is something that needs to be in our hearts and on our minds all year round so this pillow is not seasonal to me. It is something we need to think about 365 days of the year. We took out the gray dresser that has been in the living room for so long and replaced it with a dresser we found at a thrift store. I LOVE this new addition. The wood color is perfection and I think it fits the corner perfectly. I have had a stash of old, land surveyor’s measuring tools in our garage for a long time. I loved the color on them and all the numbers made them something I had to have. I have wanted a place to put them for so long and when we moved the new dresser in, Matt hung them behind it and they look amazing for fall! Of course the hutch got a fall overhaul as well. I shared exactly how I decorated these shelves from start to finish on my Instagram stories (you can find me on Instagram HERE). I added a fun, little vignette in our back porch. 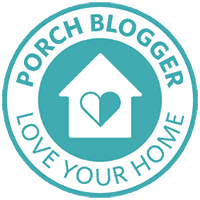 I am still working on the porch so I couldn’t share it in this parade of homes. 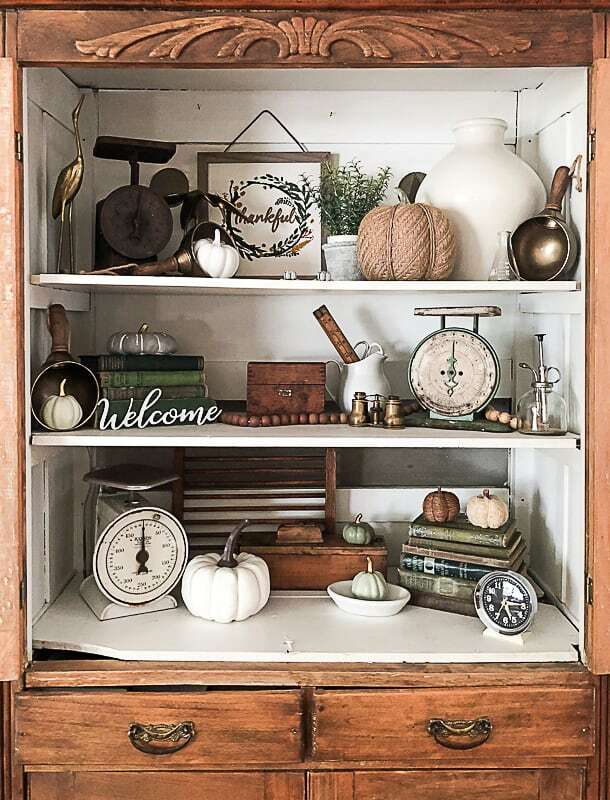 We spend so much time in our porch during the fall that I can’t fill it with a ton of decor. It needs to be a space for tailgating and watching football games. I wouldn’t have it any other way. Our home is ready for fall. We are ready to welcome it with open arms and I know things will be changed around many times before the season is over. That’s what I love about decorating. It doesn’t have to be permanent. You can change it any time to get exactly what you love. 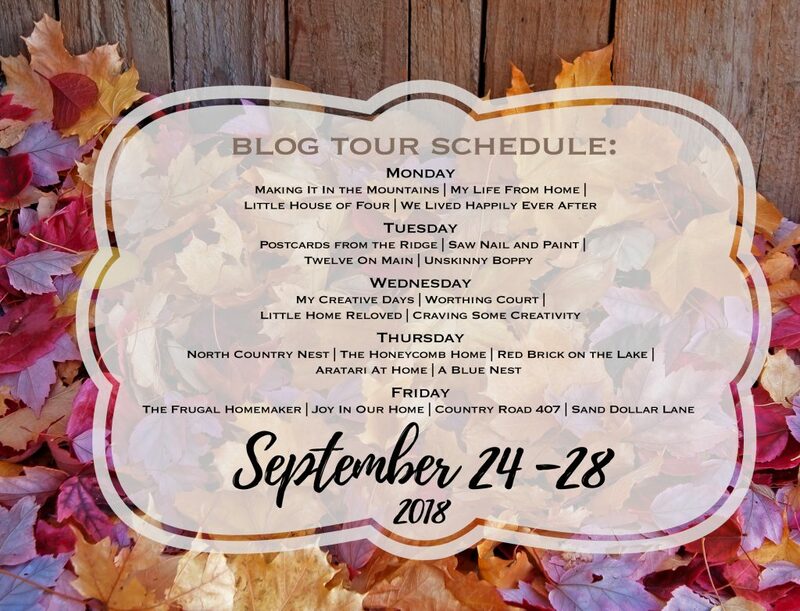 I hope this parade of homes has inspired you to get ready for fall. You don’t want to miss any of the tours below. You will love them all! Everything looks so perfectly cozy Lindsey! LOVE the pops of green with the fireplace and table and the new dresser is beautiful! Green is my love language. Always has been. Every season needs it around. 🙂 Thank you so much for stopping by! 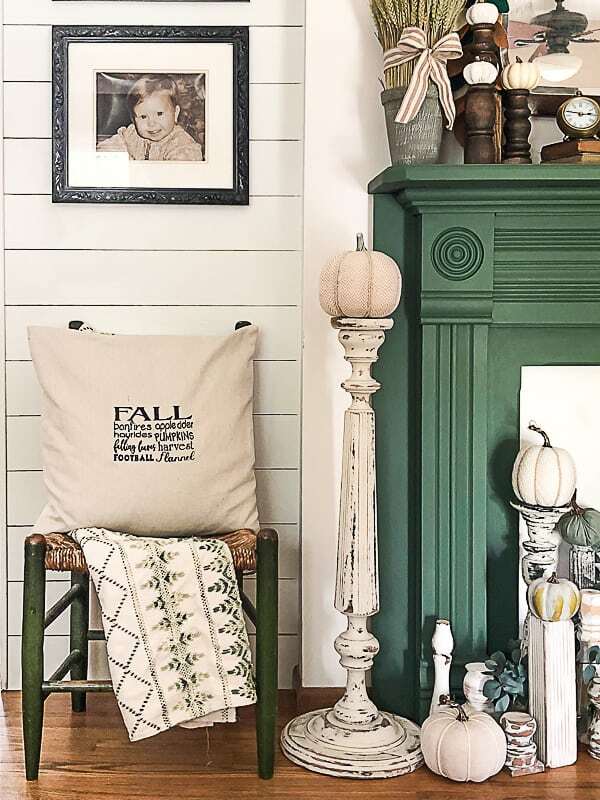 I love the pops of green in your decor, especially the mantel! That’s gorgeous. And those surveyor tools are such a great find. Everything looks so charming and cozy. Thank you Angie! So happy you stopped by! Your home looks so great, Lindsay! 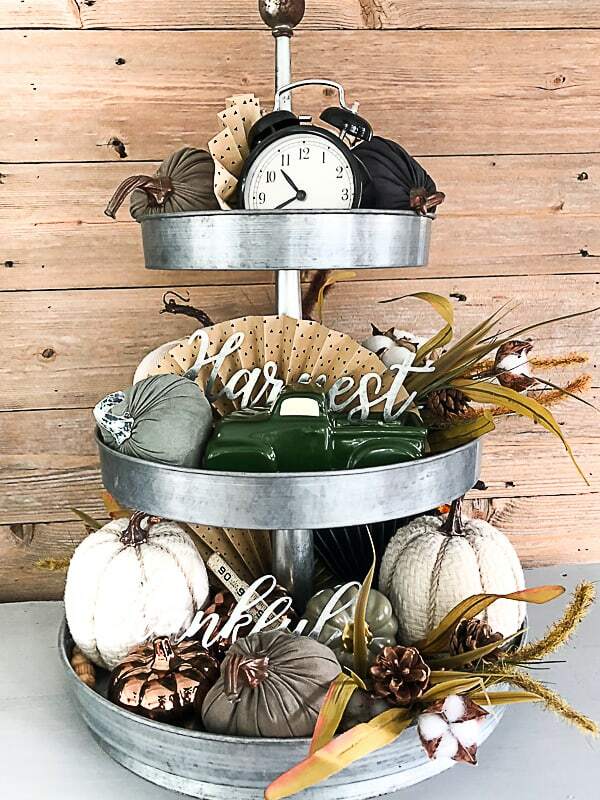 I especially love how you decorated your tiered tray stand. I love old dressers and hutches! I am always picking them up when I find them! Thank you for stopping by! Simply beautiful! 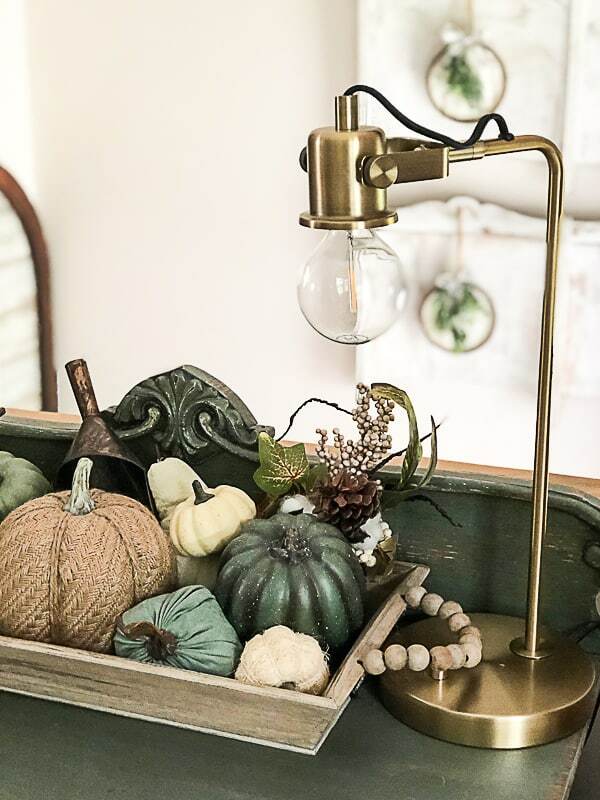 I love all your vintage goodies and I am obsessed with that little green side table! Thank you so much! That table was a great find, but the paint really made it a new piece! 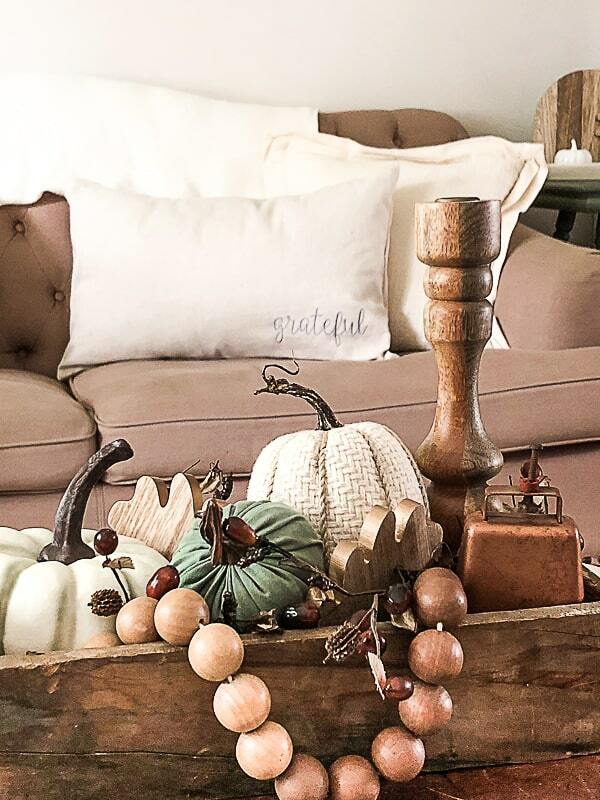 Just swooning over all your cozy fall touches! Love your hutch! So glad to be touring with you! I love your name and it is even spelled the same! Thank you so much for stopping by! Did I really just call you Kristi?!?!?! I’m so sorry. I know that you’re Lindsay! That’s what I get for trying to do too many things at once! 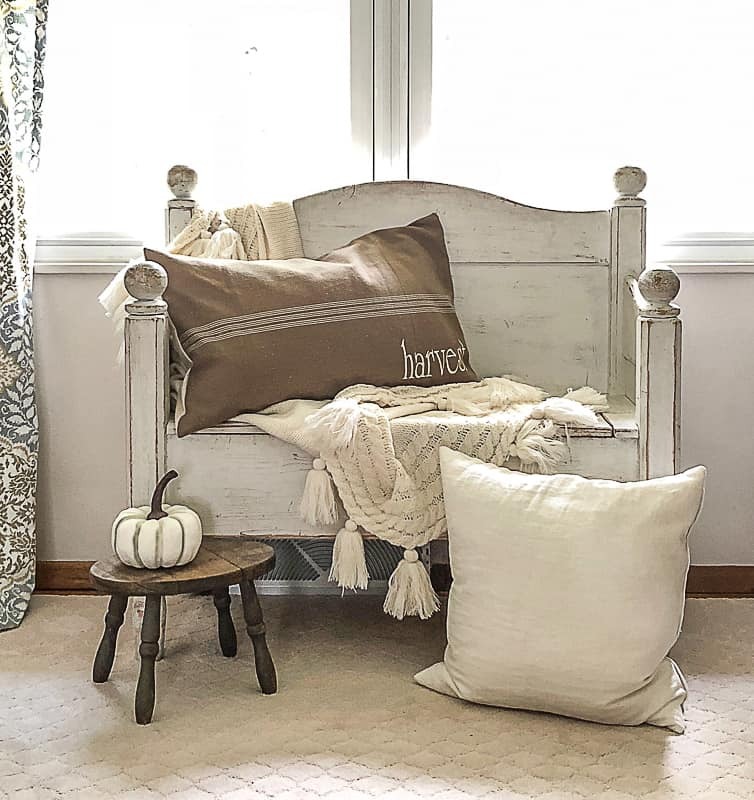 That Harvest pillow is so good! Lisa does such great work! 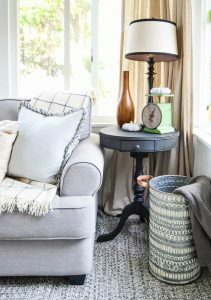 Lindsay, you really rock Fall decor! And I suddenly feel like I need some surveyor tools in my life! 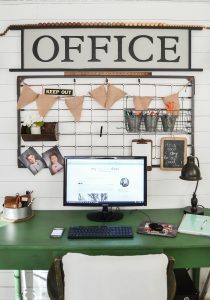 Everything is styled so beautifully, Lindsay! I love the mix of colors that you used.